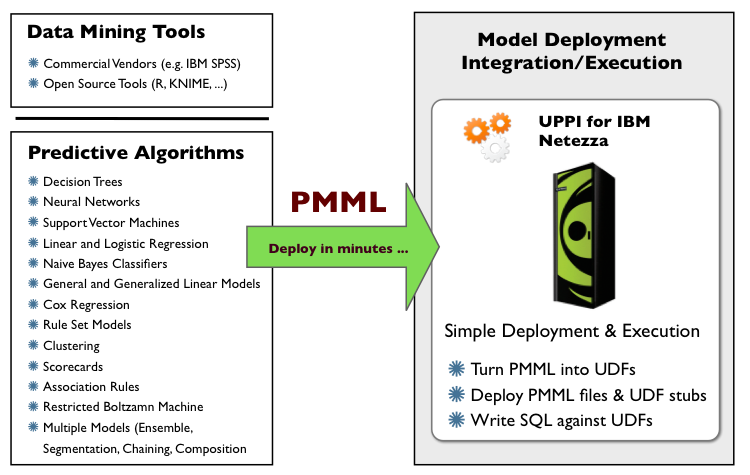 Zementis is now offering its amazing Universal PMML Plug-in™ (UPPI) for in-database scoring for the IBM Netezza appliance, SAP Sybase IQ, EMC Greenplum, Teradata and Teradata Aster. For starters, it won't break your budget (feel free to contact us for details). Also, it is simple to deploy and maintain. Our Universal PMML Plug-in was designed from the ground up to take advantage of efficient in-database execution. Last but not least, as its name suggests, it is PMML-based. PMML, the Predictive Model Markup Language is the standard for representing predictive models currently exported from all major commercial and open-source data mining tools. So, if you build your models in either SAS, IBM SPSS, STATISTICA, or R, you are ready to start benefiting from in-database scoring right away. The PMML plugin seamlessly embeds models within your database. Data scoring requires nothing more than adding a simple function call into your SQL statements. You can score data against one model or against multiple models at the same time. There is no need to code complex data transformations and calculations in SQL or stored procedures. PMML and our Universal Plug-in can easily take care of that. As well as extensive data pre- and post-processing capabilities. In addition to all these predictive techniques, UPPI accepts PMML models of all versions (2.0, 2.1, 3.0, 3.1, 3.2, 4.0, 4.1 and 4.2) generated by any of the major commercial and open source mining tools (SAS, SPSS/IBM, STATISTICA, MicroStrategy, Microsoft, Oracle, KXEN, Salford Systems, TIBCO, R/Rattle, KNIME, RapidMiner, etc.). It does not get more universal than this!